Kee Safety, a global supplier of fall protection equipment and safety railing systems, has expanded its range of safe access solutions for roof top walkways and stepovers with the introduction of Kee Walk with Guardrail. A cost effective and modular approach to guardrail protection, this system provides roofers, contractors and maintenance teams with a clear demarcation route to eliminate potential fall hazards. Designed to provide a level, anti-slip walking surface on standing seam, composite panels and metal roofing, Kee Walk with Guardrail can be easily adapted to a wide range of roof surfaces, slopes, steps, traverses and pitches up to 35⁰. Thanks to its modular design, the system can be quickly and easily set up and mounted to the roof, with no need for any on site assembly, bespoke brackets or fabrication. The guardrail – which is built from 48.3mm tubes and Kee Klamp corrosion resistant fittings – is fixed directly to one or both sides of the walkway subframe, restricting the need for too many fixings into the roof, therefore reducing the possibility of roof leaks in the future. The walkway is available as standard in nylon or aluminium trends and supplied in pre-assembled 1.5m or 3m sections to suit the requirements of different roofs. Kee Walk with Guardrail is CE approved and compliant with EN 516:2006 (Prefabricated Accessories for Roofing – Installations for roof access – Walkways, treads and steps). It exceeds the deflection criteria and slip resistance requirements of this standard and achieves almost double the friction requirement of BS 4592 in both wet and dry conditions, providing assurance that the treads are safe to walk on in all weather conditions. Thanks to reinforced nylon treads that are fire rated to Class HB of UL94, this roof top walkway system will have the same, if not better, fire rating than the roof itself. The guardrail complies to BS EN 14122-3, BS EN 13374 and OSHA requirements to provide customers staff and contractors with the best possible protection. 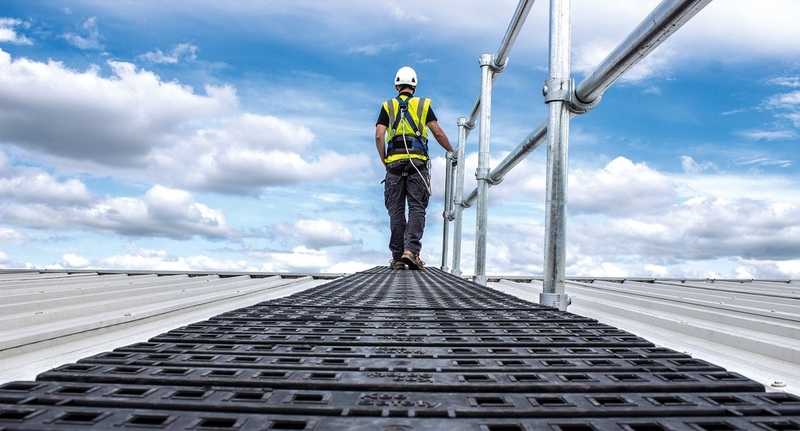 Kee Walk with Guardrail can be used in conjunction with Kee Safety stepover platforms to provide safe access across roof mounted pipework, low level walls and other plant equipment. Boasting almost 85 years in business, Kee Safety has the knowledge, technical excellence and awareness of regulation requirements to be able to market some of the best safety products in the industry. Despite having a large product offering already in place, Kee Safety continues to launch new solutions — Kee Walk® with Guardrail is Kee Safety’s 14th product launch in the last ten years.